When injectors are upgraded, the fuel pressure controlled by a factory fuel regulator may become too low, and injectors' atomization performance may be deteriorated. To improve such conditions, HKS Fuel Regulator can adjust the fuel pressure appropriate to injectors' capacity. 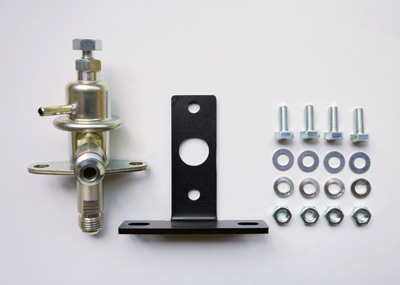 Also, HKS Fuel Regulator can increase the fuel pressure without replacing injectors to increase the amount flow. AN6 fitting can be connected to the factory delivery pipe with this adaptor. 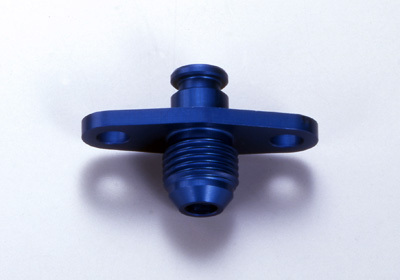 User installed fuel parts such as a fuel pressure regulator can be upgraded with this adaptor. A certain level of fuel flow amount can be maintained without replacing injectors; therefore, the initial cost to install a Sports Turbine kit can be reduced. Copyright© 1997 HKS Co., Ltd. all rights reserved.